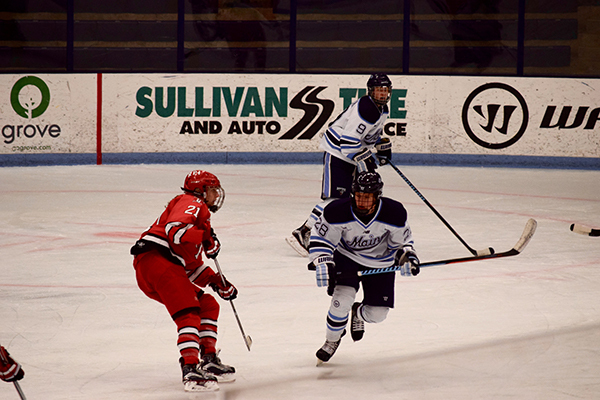 The University of Maine kicked off their season with a weekend series against Rensselaer Polytechnic Institute (RPI) starting on Saturday, Sept. 24 at 4 p.m. The second period saw the majority of scoring action in the game. Both Maine and RPI found the back of the net to knot the score at 1-1 within the first minute of the period. Black Bears first-year left wing Kara Washer was the first to find the back of the net seventeen seconds into the middle period, marking her first goal of the season. Less than 30 seconds later, RPI’s fourth-year left wing Laura Horwood found twine with an assist from first-year right wing Blake Orosz, tying the score at 1-1. “Blake [Orosz], one of my linemates, did a great job joining in on the rush, made a little drop pass to her and she gave it back to me and I was just able to bury that one top shelf,” Horwood said of her goal. RPI’s second-year left wing Makenna Thomas was assisted by second-year right wing Ana Orzechowski and fourth-year center Lindsey Hylwa on a puck that found its way past Maine’s first-year redshirt goaltender, Carly Jackson, to put RPI in the lead at 2-1 seven minutes later. Maine’s Washer and RPI’s fourth-year right defense Whitney Renn were given two-minute penalties with three minutes remaining in the middle stanza, making it a 4-on-4 situation. Maine performed well during this time, with third-year center Brooke Stacey having a prime scoring opportunity but was unable to find the back of the net. The third period was a productive one for RPI, aided by a pair of Black Bears miscues. Maine’s first-year right wing Tereza Vanisova was assessed a five-minute penalty for boarding. Less than two minutes later second-year, Alyson Matteau was given a penalty for checking, leaving Maine with only three players on the ice. Seconds later RPI capitalized on the opportunity. Third-year right defender Hannah Behounek squeezed a shot inside the post to beat Jackson, bringing the score to 3-1. In the last minute of play, Maine pulled Jackson for an extra attacker but the Black Bears were still unable to find the back of the net. Both goaltenders performed well, with RPI goaltender Lovisa Selander saving 29, only letting one goal in and Maine’s Jackson let up a trio of goals on 26 shots on goal. “It’s been a long time coming with being a redshirt last year, but just really excited to compete for my team and do my best to give them the best opportunity to win,” Jackson said. In the second game of Maine’s two-game series with RPI, the attitude on ice was a very different one. Maine was back for a win and RPI tried their hardest to not let that happen, but in the end were unsuccessful. Maine’s momentum was too much for RPI to hold off and Maine ultimately took the win 2-0, splitting the weekend series. Similar to the first game of the series, Maine was able to find the back of the net in the first minute of play in the second period on a leftover powerplay from first period. Washer found the back of the net with assists from Vanisova and first-year center Vendula Pribylova, putting Maine onto the scoreboard 1-0. “I think we came ready today. We knew what we were doing, we were meshing together. We got our first game nerves out of the way,” Washer said. It wasn’t until halfway through the third period that Maine made another mark on the scoreboard. Vanisova was assisted by Pribylov, who brought the puck all the way down the ice to get another one past Selander, bringing Maine to 2-0. Although the first period was scoreless, it wasn’t for lack of effort. Selander saw 16 shots on goal in the first period, compared to RPI’s three. “I think that we were more ready to go yesterday. Today we kinda came in as we won yesterday and we weren’t really as pumped,” Selander said. The rest of the game did not see any scoring. Neither team was able to capitalize on their power-play opportunities, despite the fact that there were 12 combined chances. Maine’s fourth-year goaltender Mariah Fujimagari got the win, stopping 20 shots on goal from RPI, while Selander took the loss, despite holding off 29 shots on goal. RPI tried to catch up in the last minute, pulling Selander in favor of another offensive player, but they were not able to find the net. Maine’s whole team performed well, but the defense in particular didn’t let in a single goal to give them the shutout. “I thought our gaps were much better, we moved the puck a little bit better. And then we had a full game to scout them since it was the first weekend of the season we hadn’t really been able to see RPI play before,” Reichenbach said. After the weekend of action, RPI moves to 1-1-0 as Maine also moves to 1-1-0. RPI will return to the ice Sept. 30 against Ohio State University in Troy, N.Y. with puck drop scheduled at 6 p.m. The Black Bears will travel to Connecticut for a weekend series against Quinnipiac starting Saturday, Sept. 30 at 6 p.m.